Seven years ago today, Raith Rovers claimed a 1-1 draw at home to Ross County in the Scottish First Division. The Fife Free Press headline read 'Impact subs combine to earn team a point' as on loan Hearts winger Jamie Walker rescued a point in the last minute. It was eighth in the table versus the league leaders, with County five points clear at the top with two games in hand, while Raith sat just two points in front of bottom place. TEAMS are often judged on the strength of their bench. Whether it be holding onto a winning position or overturning a losing one, subs can play a key role in shaping the outcome of games. 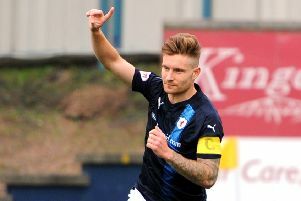 On Saturday, it was Raith Rovers who were grateful for their replacements, as Brian Graham and Jamie Walker wiped the splinters from their shorts to earn their team a vital point. While it was the two subs who combined to score the last minute equaliser, the 11 who started didn’t fare too badly either. Rovers were a match for the league leaders for most of the 90 minutes, except for a 10-minute period after half-time when the visitors stepped up a gear and scored their opener. In the end it was a deserved point for the Kirkcaldy men, and one which kept them out of the relegation play-off position, albeit on goal difference. The first half was a war of attrition with Rovers doing most of the pressing against a well-organised County side happy to sit back and look for chances on the break. The best opening of the first half was gifted to the home side on 11 minutes as County goalie Michael Fraser came for a cross he had no chance of reaching, and the ball flew over his head to the unmarked John Baird, but with the goal at his mercy, Rovers’ top scorer blazed over the bar. County’s best moment of the opening half was during a 22nd minute counter-attack which saw Mark Corcoran get into a shooting position just inside the box, but he dragged his effort across the face of goal, and a yard wide. The half-time consensus was that County’s 17-game unbeaten run was there for the taking, but the title favourites showed their teeth after the break, taking the lead in their first cutting move of the match. The ball was played in behind right back Reece Donaldson, and when Corcoran reached the by-line his cut-back was slammed home by unmarked Steven Craig. It was a good move but the Raith defence switched off. Rovers’ spirited response to going behind was indicative of a team in desperate need of points as they pushed forward in search of an equaliser. Allan Walker tested Fraser with a low 25-yard free-kick which the ‘keeper spilled, only for a defender to react first to clear. Fraser fumbled again under pressure from Pat Clarke on 67 minutes but Walker’s follow-up shot was booted off the line by Grant Munro. Damian Casalinuovo glanced a header just wide, while at the other end David McGurn was at full stretch to tip over a ferocious Corcoran strike from 20 yards. Just as Rovers comeback hopes were beginning to fade, John McGlynn introduced Walker and Graham from the bench. And it proved a masterstroke as the pair broke forward in the 89th minute, exchanged passes, with Walker sending a low finish underneath the diving Fraser to bring some much-needed cheer back to Stark’s Park. The Raith team that day was: McGurn, Donaldson, Davidson, Murray, Dyer, Clarke (Brian Graham 77), Williamson, Allan Walker, Hamill, Baird, Casalinuovo (Jamie Walker 83). Subs Not Used: Laidlaw, Ellis, Callachan.